Well, that’s something you don’t see every day! 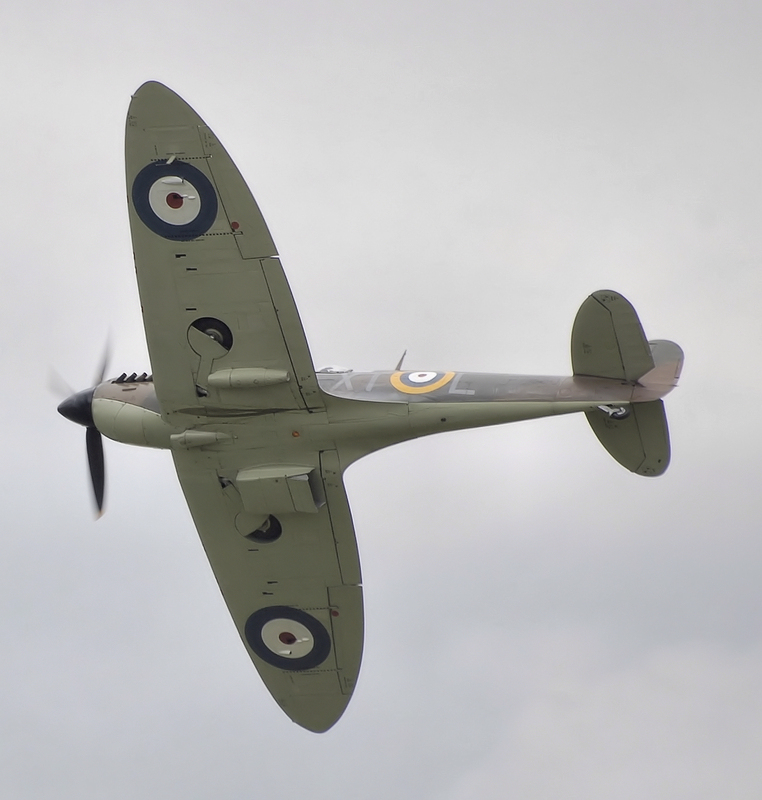 I was sitting in the garden just now, doing the crossword, when I heard the unmistakeable sound of a World War II fighter aircraft flying overhead. I looked up and there it was, right over my house. A Spitfire no less. The outline was instantly recognisable, especially because it was flying so low, on account of its curious elliptical wing shape. It was also low enough for the extraordinary roar of the Rolls Royce engine powering this exceptional aircraft to shake the windows in my house! I once had the chance to sit in the cockpit of a Spitfire, in an aircraft museum, not one that was flying! The thing that struck me most was how very small and cramped it was, and I’m not particularly tall (although I’m a bit wider than I used to be). It turns out that the appearance of this aircraft in the skies over Cardiff was related to an event called Armed Forces Day which is happening in Bute Park, just a matter of yards from my house. Seeing the plane reminded me of the 60th anniversary commemoration of the Battle of Britain in 2000 during which the newspapers reprinted contemporary accounts of the summer of 1940 during which Britain stood alone, and on the brink of the abyss. The thing that struck me most about the heroic pilots who saved this country from invasion was that they were all so young. The same age, in fact, as the students I teach. I wonder how many of todays 18-20s really understand the scale of the sacrifices made by the corresponding generation of 1940? I had a friend – now long dead – who served in the RAF during the Battle of Britain and I once asked him about the tactics they used. He explained that they didn’t really have any tactics. When scrambled they were usually lucky if they managed to get to the right altitude before the enemy were on them. And if they did they just flew straight at them and tried to shoot them down. There was little point in attacking a big formation from behind with a handful of planes, which was the usual situation. You might pick off one or two but the bombers would carry on to their target. You had to attack from the front in order to scatter them. He added that on a good day, if you were feeling exceptionally brave, you might even keep your eyes open as you screamed into them at getting on for 400 mph. The other thing that this event reminded me of was the film Battle of Britain. The movie is a bit dated now, largely because some of the special effects don’t really stand up to modern comparisons: no cgi when it was made, for example. The best thing about it for me, though, is the wonderful music written for the film by William Walton, especially in the following sequence where the dogfights are shown with only the music as soundtrack. This turns the shots of terrifying close-range combat into a something a lot more than an action movie. In fact, this is a real piece of art. The context of this sequence is, as far as I know, historically accurate. Over the summer of 1940 the Luftwaffe had sent raid after raid over to attack Britain, these raids increasing in size as time went on. Hugh Dowding, Head of Fighter Command at that time, refused to let his planes be drawn into a huge battle against numerically superior forces and instead kept most of his planes in reserve, sending up only a squadron or half a squadron to meet the incoming planes. Thanks to the breaking of the German Air Force Enigma code, Dowding knew that the Luftwaffe pilots had been handing in grossly exaggerated reports of how many planes they had been shooting down. Convinced that the RAF was on the brink of collapse, the Germans launched an enormous air raid on September 15th 1940 intended to deliver the knockout blow and prepare the way for invasion. Dowding knew that they were coming, and put every available plane at the RAFs disposal into the air. He staked everything on this battle. There were no reserves. When the Luftwaffe arrived over Britain they found the air filled with Spitfires and Hurricanes whose pilots, having been consistently outnumbered in the battles so far, relished the chance to fight for once with something close to numerical equality with the enemy. The RAF scored a decisive victory, convincing Hitler to abandon his plans for an invasion in 1940.